Kid Ultra is the pinnacle of LLC support technology. 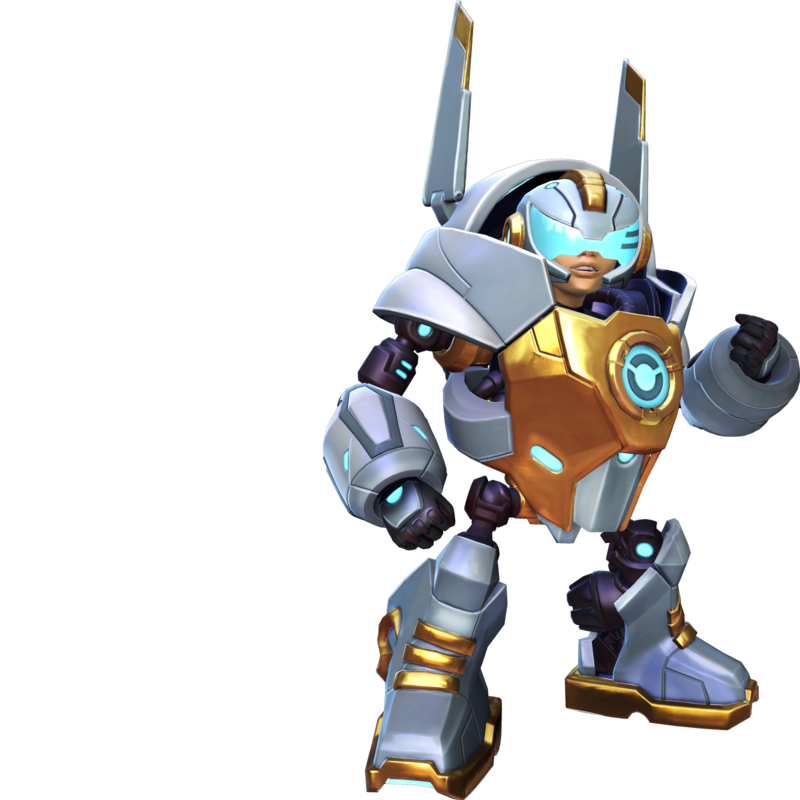 Programmed with all sorts of gadgets to assist or subdue a target as he sees fit, and to support his team by healing and buffing allies with support drones and locking down enemies with crowd control. Participating in kills boosts nearby allies’ damage for major and minor enemies. Kid Ultra’s right gauntlet houses quick-fire rockets which detonate on impact. Fire rockets in a tight spiral. Deploy a drone that follows a target ally, increasing their maximum health and granting additional health per second. Fire bolas that pass through units, dealing damage to enemies and slowing them. Enter hover mode for increased mobility. Activate again to transform back, restoring health to yourself and nearby allies and pushing back nearby enemies. Reduces the cooldown of Support Drones. If a Support Drone connects to a target immediately when spawned, the target’s shield will instant begin to recharge. Increases the number of rockets that can be fired from the Rocket Gauntlet before reloading. Hitting enemies with Bola Snare reduces the current cooldown on Support Drone. Increases the duration of the effects of Aura of Justice. Support Drones amplify the damage of affected allies in addition to other benefits. Increases Rocket Gauntlet and Rocket Vortex base damage. Support Drones grant an addition burst of healing to all nearby allies when spawned. Bola Snare explodes on each impact with an enemy, dealing damage and slowing all enemies in the blast radius. While To The Rescue is active, nearby allies are gradually healed. Enemies damaged with Bola Snare take additional damage over time. Support Drones no longer follow allies, instead remaining in place and healing all allies within an expanded area of effect for several seconds. Firing a full, 3-rocket Rocket Vortex propels Kid Ultra backwards. Can be used once every 2 seconds. Bola Snare bounces off of environment surfaces and toward a nearby enemy up to 3 times. The minor effect of Aura of Justice now heals nearby allies instead of improving damage. When the Bola Snare damages an enemy’s shield, Kid Ultra’s shield recharges by a portion of the damage dealt. Increases movement speed whenever shielded or overshielded. Increases the number of Support Drones that can be simultaneously active. Enemies affected by Bola Snare are stunned, rather than slowed. To The Rescue damages enemies in addition to healing allies.